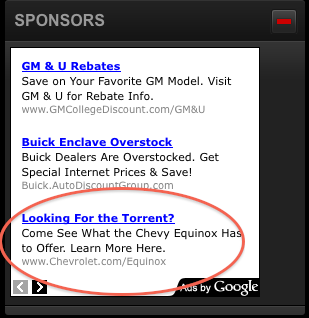 Check out this Google Ad that popped up on the GM Authority website nigh a few minutes ago. Come See What the Chevy Equinox Has to Offer. Learn More Here. This is solid proof that GM has every intention of keeping owners of its discontinued brands in the General Motors family. This time around, The General is funneling Pontiac Torrent buyers (current and potential) to the (much-better) Chevrolet Equinox. The strategy seems to be working: despite sending three of its eight brands to the automotive graveyard (Pontiac, Saturn, Hummer) and selling another (Saab), The General still has the highest U.S. market share. Have you seen any other ads targeting owners of GM’s discontinued brands? Let us know in the comments below! I haven’t seen other ads for defunct brand owners moving to chevy buick, GMC or Cadillac yet I believe its a targeted marketing campaign. Smart move and I hope it works.